"Is it better to assume the worst, be miserable and possibly be surprised? Or to assume the best, be eager and possibly be disappointed?" Psyche, Goddess of the Soul. Stephanie's hair is wavy, long and brown. Her eyes are an odd shade of lavender-tinted silver and she stands at about 5'7" in height. Her hair reaches a bit below her shoulders and has tints of auburn and black as well. It isn't completely wavy, but it isn't completely straight. Her hair is an odd mixture between the two, causing it to have an indescribable appearance. Steph's eyes are almond shaped and are often covered in harsh makeup and eyeliner. Her irises are an odd shade of lavender-tinted silver. In the light they shine like the moon, but in the shade their true purple color stands out. Her face s heart shaped, her cheeks are slightly chubby, and her skin is rather pale. Her lips are pink and curl up in a cat-like smile when she is happy. She style of clothing is rather unique. It varies between rocker, a modern hippie style, and simple t-shirts and jeans. However, she favorite style of clothing is a mixture between bohemian and hippie. She often wears head hands, scarves, flowing shirts, vest and other types of clothing that fall into those two styles. She loves to walk around barefoot, which has caused her feet to be rather calloused. For the past two years, Steph's socks have been purposefully mismatched and crazy. If she is ever wearing normal socks, then it is obvious she is in a bad mood. Stephanie is goofy, artistic, happy-go-lucky, odd, smart, wise, temperamental, and sarcastic. She loves to make people laugh at her klutzy, goofy, fun sense of humor. Often she'll have a wide grin or a happy smile on her face. Steph is artistic. She draws, paints, writes poetry, plays the piano and saxophone, and sings. Her dream and passion, however, is to illustrate. She dreams and longs to go to an art college and illustrate for books, comics, cartoons...anything she can find. Stephanie has quite a bit of a temper. She isn't easily angered, but she can get irritated rather quickly. And her irritation grows quickly into anger as time goes on. She'll often then lash out with rude remarks, sarcastic comments, and harsh words without giving it much thought. Stephanie can be rather reckless and doesn't put much thought into things. Her flighty nature and short attention span make it hard for her to focus on things and easily gets her distracted and off doing goodness knows what. Stephanie, although she doesn't seem it, is very wise and good at giving advice. Even though she finds it difficult to focus, if the situation calls for it, she's a good listener and often gives advice or help to those who need it. Stephanie has quite bad self-esteem issues. Many say that she should follow her won advice and stop criticizing herself. Stephanie was born in Arizona, after living there for three years she was found by a satyr named Thistle. She and Thistle traveled to Camp Half-Blood and Stephanie has been at camp ever since then. She was unclaimed for six years but then was claimed as a Daughter of Psyche when she was about nine years old. 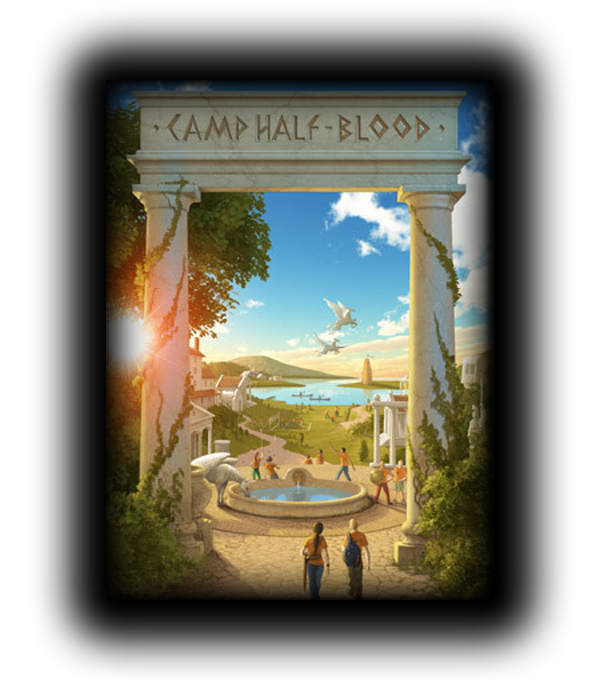 Stephanie does not remember much of her father, since she has been at Camp Half-Blood most of her life. However, she does wish to visit him. But she does not ever leave camp. Stephanie has many weapons. Her most powerful is her Mirror. Although it seems odd, Stephanie, being the Daughter of the Goddess of the Soul, is able to see into people's darkest secrets and the deepest part of their souls and show them the thing that bothers them the most through this mirror. It doesn't take long to do this, unless the person has a mind block on. However, Stephanie does not run into this obstacle often. Stephanie also has a 3' long, curved, double edged celestial bronze sword. This sword has no name and it is a silver moon shaped pendant when she's not using it. Seeing peoples wants, desires, fears etc. She can take the soul of another, however she must sell her own to do so. Stephanie can revive someone who is recently deceased by retrieving their soul before it reaches the Underworld. However, it requires quite a bit of energy and she could die in the process. Stephanie hardly ever uses her abilities. She finds them cruel and unfair and tries to keep them to herself as much as possible. "Music is love, Music is life, Music is everything that brings a smile to the face of those is pain." Benny has shaggy black hair, tan skin, stands at about 5'9" in height and can be considered rather scrawny compared to most at camp. Benny, even though he's been at camp for quite a while, has found that he is somehow unable to get the muscular look of the Ares children. He has some strength and a few visible muscles in his arms, but the idea of a six pack and large biceps is simply a dream for him. Even though he isn't very strong, Benny has an advantage of height. He's quite tall often towering over many of his cabin mates. He was very short when he first came to camp, but experienced a massive growth spurt his seventh year in. Benny tends to wear simple clothing. Plain v-neck t-shirts and jeans. His idea of dressing up is not wearing sandals but tennis shoes instead. If he is ever forced to wear a "monkey suit" then he is always uncomfortable and fidgety. Benny is sweet, kind, oblivious, a goof ball, loud, and rather irritable at times. His friendly, happy and "sunny" disposition make him rather popular around camp. He is hardly ever rude on purpose, unless it's in a joking manner. However, these jokes of his have gone a bit too far in the past. Benny is very musical and creative, since he's a child of Apollo. However, is talents really only lie in guitar and singing and he is not considered the best in his cabin. Benny, even though he is a child of Apollo is not gifted in sports or prophecies else like that. He often finds it difficult to heal any injuries or broken bones properly. His true gift lies in something that most Apollo children do not have. He is gifted in healing, but not injuries. His gifts lie in healing sickness. Therefore, he wishes one day to be a doctor. Benny loves to help others and will often neglect responsibilities to do so. Benny, when he is irritated by something, often tends to hold a grudge. However, this grudge and anger is not just against the one person that irritates him. The rude and angry attitude he gets will be given to anyone he comes into contact with. He always feels horrible later when he does this and will often go into a minor state of depression if he was truly angry and rude to someone he cares about. Benny is quite a romantic. However, he remains quite oblivious with the romances he fantasies about involve him. He can be considered a "stupid boy" and has been called so often. Benny has lived in twelve different places and gone to fourteen different schools in the six years he wasn't in camp. He has been kicked out of all of them. He was considered quite the trouble maker and has been banned from every school in New York City. He knew who he was, since his father told him when he was four. However, he chose to stay with his mother for reasons he doesn't enjoy discussing. But when his mother died when he was six, he went to Camp Half-Blood. Benny, unlike most Apollo children, is not gifted in archery. His gift lies in swordsmanship and hand-to-hand combat. He has two swords that he uses to fight, both nameless. When they are not swords, they are two gold sun pendants that hang from a black band on his wrist. Benny has a rather unusual pet. A griffin named Lyon. This griffin does not stay at camp, but when Benny needs him all he has to do is blow the whistle that hangs around his neck. "It's like the sun, rising and falling. Everything will have it's ups and downs, it's days and nights. The point is to make the best of it, because it' what we're stuck with..."
Alectrona, solar goddess of the morning or waking up. Taylor was born in England, grew up there for most of his life. He soon became best friends with a girl who moved to his small, hometown of Bilbury. However, what Taylor did not know, is that this girl was a Daughter of Thaumas, god of the wonders of the sea. She said she and her father traveled all throughout the world searching for treasure and artifacts that had been cast to the bottom of the sea. She claimed to have seen the wonders that no man had ever seen, but Taylor didn’t believe her. However, her tails and free spirit intrigued Taylor and they quickly became friends. Soon, however, Carly, his demigod friend, moved on in search for more “treasure”. She wrote to Taylor and one day sent him an address and told him to go there. However, Taylor wouldn’t leave his home and his younger sister, Bethany. But Taylor’s stubborn nature to leave the small town he called home cost his father and his younger sister their lives in a brutal attack by a Sphinx. Taylor mourned for weeks on end at the loss of his family. And one faithful, dreary afternoon Taylor was rummaging through his father’s old things and found a letter addressed to him. After reading the contents of the letter and finding out who he was, Taylor left England, traveled to New York and made his way to Camp Half-Blood. Taylor stands at about 5’6” in height. His build is somewhere between scrawny and slightly muscular, so he isn’t very strong. He has broad shoulders, large hands and feet, and a square jaw line that simply makes him look British. His slightly large mouth is often turned up in a small smile, even though he may not be very happy at that specific moment. Taylor’s hair is flippy, brown, and sits in a mop at the top of his head. His bangs swoop down, often covering his face a tad when he is depressed or upset about something. He has streaks of light, mousy brown and golden blonde here and there from his time in the sun. His hair can not be classified and curly or straight, it is simply flippy and often unable to control. Taylor’s eyes are the things that people often notice first. Almond shaped and large, they attract much attention due to the fact that they are oddly colored and sit underneath his bushy brown eyebrows. His irises are multicolored. They start as an orangey gold and fade to a tealish-blue with hints of navy and flecks of silver. People often describe them like the early morning. The gold represents the rising sun and the cool, dark blue represents the fading night. This is what often gives away his godly parent. Taylor’s skin is pale and untanned. He has a few freckles on his face and his cheeks are rosy and often make him look as though he is blushing, even though he hardly ever does. Taylor’s choice of clothing is a simple one. He tends to wear slightly higher end clothes, plain white t-shirt underneath and a button down plain shirt over it with plain, baggy jeans. He doesn’t have much of a sense of fashion and sees no point in the matter. Clothes are clothes, that’s how he sees it. Taylor has a simple, polite personality, if not a bit quite. He doesn’t speak much anymore and can seem rather down at times. Taylor is soft spoken, his polite, British manner and high regard for other’s feelings makes him quite popular around people (mostly girls.) He often apologizes for things that amy not even be his fault. His constant guilt and sad smile makes him seem rather depressed, and most of the time he is. Since the loss of his beloved father and little sister, he had been different. Before that tragedy he was funny, quirky, and sweet. He had a great sense of humor and a positive outlook on life. But now, the largest laugh you can get out of him is a minor chuckle. Taylor, even though he’s more quite, is still as sweet as could be. He is polite, considerate and kind hearted. His warm smile and strikingly comforting eyes are enough to brighten anyone’s day. Taylor doesn’t have much of a temper, he tends to bottle all of his feelings up and remain slightly cold rather than opening his heart to everyone. He has quite prominent trust issues and takes a long period of time to warm up to people. Taylor is stubborn, his strong beliefs make it hard for anyone to change his mind once it is set. His stubborn nature and lack of trust help to make up his fatal flaw. Taylor had a pet dog when he still lived in England but the dog died years ago. However, Taylor loves dogs. He wishes to get another soon, but never got around to it. Taylor’s lack of upper body strength make it hard for him to hold a sword and shield, handle a spear, or control a whip. So he relies of now and arrow. He has a natural talent for archery, but could still use quite a bit of work on the subject. - He doesn’t know it yet, but Taylor has the odd ability of “Light Travel”. It’s similar to shadow travel, but he uses light instead. Taylor enjoys reading in a quite place, walking through the forest, watching the sun rise, and simply having a quiet, peaceful, place to himself when he has time to spare. Because Taylor lived in England most of his life, his accent is thick and flows melodically through the air. "Go away...I don't want to talk to you. Why should I bother opening my heart when you don't even care enough to pick up the pieces when it breaks?" Poseidon, god of the sea. When Lizzi was less that a year old, her mother abandoned her in a local orphanage. Lizzi lived there until she was ten, wanting to know who her parents were. But like most children there, she didn’t know. She was switched from house to house...parents claimed she’d cause trouble...She was adopted and abandoned again so many times that they had to switch orphanages. Lizzi was given a bag to carry her small amount of clothing and was taken from the small orphanage in Maine, to a larger one in New York. A small stature, scruffly looking man hobbled into the orphanage. He wore a hat, a long coat and had a goat like beard. He walked over to lonely, little Lizzi and smiled. “Come now child...I’ve got a home for you,” he said. Lizzi stared wide eyed at the man, but felt she could trust him. “Where are we going?” she asked as she was dragged along by the man. He turned. “We’re going to your new home...come now. They’ll explain everything when we get there, but we must hurry,” he said, kicking off his shoes to reveal his hooves. “Glad those things are gone...we can move faster now,” he said, picking up his pace. Lizzi still saw the friendly, old satyr every now and again. Mr. Lamis she called him, however he is referred to by others as simply “Lamis”. Lizzi stands at a small 5’4” in height. Her frame is an average sized one with lovely curves and long legs. Her lack of muscle makes it difficult for her to battle, but she’s okay with that. Lizzi has a heart shaped face and a slightly rounded chin. Her nose, being regular sized, sits in the middle of her face between her beautiful eyes and thin lips. Her cheek bones are not profound, giving her cheeks a slightly chubby appearance. Lizzi always complained that her nose and ears were too large, but they really aren’t. Lizzi’s eyes are a beautiful shade of hazely gold that reflect light in a dazzling manner. However, seeing all the extravagantly colored eyes at camp make Lizzi feel as though her’s are boring. Her eyes are almond shaped and crinkle when she smiles. Framing her eyes are her long, think eyelashes. They are naturally lightly colored, due to her blonde hair, but she cakes them with mascara to make them stand out more. Lizzi’s hair is long, wavy and a golden shade of blonde. It reaches about half way down her back and blows easily in the wind. Lizzi doesn’t do much with her hair, since she’s gotten lazy over the years. If she does anything to it other than pull it up in a messy ponytail then she’s obviously trying to impress someone. Due to Lizzi’s past, she guards her emotions. This gives her a cold, rough, harsh personality. She hides herself behind intimidation and her though nature and deliberately tries to keep people at a safe distance. Lizzi obviously has many issues...she’s not trusting, she’s mean, cold, seems uncaring, and harsh to judge. However, this is just an act. In reality, Lizzi is scared, alone and sad. She wishes to meet her mother and ask why she left her alone all those years. Lizzi, although she is harsh and cold, is also very talkative. However, most of her comments are the things that drive people away. She hates having attention, so she wears simple clothing. She wants people to believe that she doesn’t care and hopes that they can’t see she does. She acts like she is emotionless and cold, but she’s really rather fragile. Despite all of these things that Lizzi uses to keep people away, she is also very caring and sympathetic, especially to other foster children. Once someone spends the time, looks past the harsh words, and puts the effort in to get to know her, Lizzi is kind hearted, caring, and extremely loyal. Once she trusts someone, she is with them or life. However, Lizzi tends to have a slightly negative outlook and never expects good things to last long, even though inside she begs that they do. Lizzi uses daggers as her weapons. She is able to make them out of water and ice and uses them in battle. However, she must have access to water to do so. So, if she is in a dry area and there’s no water, she’s sadly out of luck. That’s why she keeps one pocket knife in her shoe at all times. Like most Poseidon children, Lizzi has a strong connection to water. She can control it, use it in battle, and not get wet when she’s in it. Because Lizzi doesn’t really have friends, she trains quite a bit. So, she has learned how to truly master the art of controlling water and has even begun working with ice. However, her talent in frozen water is not as strong yet. Lizzi has never been on a quest, but she longs to do so. But she’s never been invited because no one really enjoys her company. "Go away...like you want to actually to hear from me...."
Three he thinks, but he’s really been at camp for thirteen years. On a quest to the underworld three years ago, Vince had his memory wiped. After that, he was unaware of who he was. If it wasn’t for the two people he was on the quest, he’d be wandering around aimlessly and helplessly. He went to camp, completely unaware of himself. He was told his name and others tried to help him regain his memory, but it didn’t help much. Now he just trains because he knows that there’s a large threat out there. And over the years, he has learned to live with not knowing who he is. Max stands at about 5’11” in height. He has broad shoulders, large hands and feet, and a hefty, muscular build. His black hair is shaggy and messy most of the time, since he doesn’t bother doing anything to it. His eyebrows are thick and black and sit above his almond shaped, strikingly green eyes. His skin is slightly tanned and he has stubble growing on his chin. He often had a serious, unemotional expression and never looks like he really cares about anything. His nose is slightly large and his jaw is square. He does not have high cheek bones, his features are softer. Max tends to wear rather fancy clothing. He enjoys dress shirts and vest paired with jeans and red converse. Because of his lack of memories, he doesn’t really know how he should act. He can’t blame his actions on his harsh past, because he doesn’t know what happened to him. So, he just pushes people away with harsh words and rude remarks. He is quite and doesn’t talk much, but when he does he prefers to be mean. People have begun calling him a “typical Son of Hades”, and he doesn’t care for that very much. Max doesn’t really have much of a temper. Because he hides emotions and remains cold, his anger stays bottled up. If he had one, he doesn’t remember. Max has a long, double edged sword with a black hilt that has been painted silver. He also has a curved, bronze sickle. These two weapons are used in close combat. He lost all of his fighting skills due to his memory loss, but over the three year he has gained most of them back. He also has a few daggers, but he does not remember his skills for using them. Max can control darkness and shadows, he can shadow travel and does so often because he gets lazy. He apparently used to know how to raise dead to due his will, but he hasn’t learned how to do that again yet. Like his memory, his skills and talents and a fighter and demigod were also wiped away. So he is no longer the strongest or most talented, now he is simple known as the kid who lost his memory. Max secretly wishes he could be the person that everyone describes and please all of the friends he used to have by regaining his memory. He spent a year researching ways to regain his memories, but he has found none that were affective.